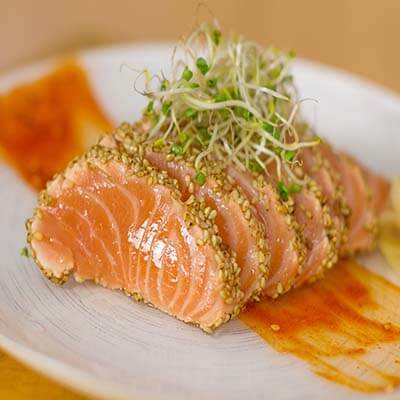 A beautiful seared salmon filet encrusted with sesame seeds; this succulent Bearded Salmon Sashimi strikes a bold esthetic on any sushi platter. Simple, yet decadent, it’s the perfect pairing to Chef Devaux’s signature Spicy Korean Sauce – subtle spice that imbues the salmon with warmth! Place the salmon filet flat on the chopping board, and with a steady hand, lightly drizzle a conservative amount of sesame seed oil over the surface. Rub in the Sesame seed oil with your fingers, coating the salmon in its entirety. Turn the filet over and repeat for all four sides only. Pour a small quantity of sesame seeds onto a plate, ensuring the entire surface area is covered. With your fingers, transfer the salmon filet over to the plate. 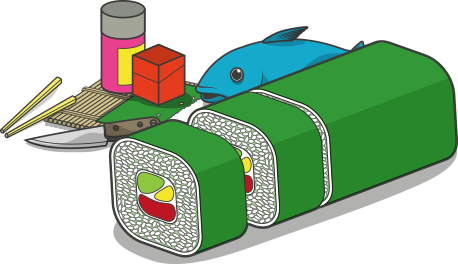 Roll the filet over on the plate, coating all four sides. Avoid coating the ends, as they will need to remain exposed. Heat a small quantity of sesame seed oil in a non-stick frying pan. When hot, transfer the salmon filet to the pan. Sear each side for 10-15 seconds – with the exception of the uncoated ends. Avoid overcooking the filet at any point, as this will cause the fish to disintegrate upon handling. Transfer back to the chopping board using a spatula. Position the filet horizontally on your chopping board. Apply firm pressure with your fingers to hold the filet in place, and with your knife, make a hira-zukuri (rectangular) cut approximately 0.5-1 cm (1/5-2/5 of an inch) in from the end. Simply align the heel of the knife with the top of the filet, and allow it to glide through the flesh to the tip. Repeat this cut for the remaining filet portion. Using a paintbrush, lightly paint a thick, diagonal line of Korean spicy sauce across the surface of your presentation plate. If necessary, add a second ‘coat’ for a bolder esthetic. Slide the blade of your knife underneath the salmon slices, and supporting them with your fingers, transfer over to the plate. Position the salmon slices diagonally on the plate, in the opposite direction to the sauce. Add polish to your presentation with a pinch of pickled ginger set to the right of the salmon, coupled with a small heap of watercress atop the sashimi slices. Serve with a small ramekin of Chef Devaux’s signature Korean Spicy Sauce.